This simple puff pastry tart only has a few ingredients and can be made quickly, for dessert, breakfast, or brunch! Beat together cream cheese, maple syrup, and vanilla and until creamy. I'd suggest starting with less sweetener and adding more to taste. Set aside. Place thawed puff pastry on a large piece of parchment and roll out into a larger rectangle. Use a fork to prick all over the center of the pastry, leaving a 1-inch border. Transfer the parchment with the puff pastry onto a large baking sheet. Spoon cream cheese mixture onto the pastry and spread all over the center, leaving the border plain. Top generously with fresh berries. 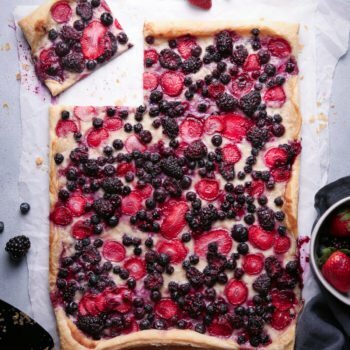 I didn't use sweetener on my berries, but if your fruit is tart, you can toss it in 1–2 tablespoons of maple syrup before placing on the tart. Bake tart in the preheated oven for 20–30 minutes, until crust is golden. Makes about 12 servings.